& Mouth Certificate (full dentition) !! There are three levels of Schutzhund (I, II and III) with increasing difficulty at each level. Schutzhund is a sport which involves tracking, obedience and protection. Tracking proves the dog's ability to use its olfactory senses to follow a scent trail. Obedience demonstrates the dog's willingness to obey commands and be a working partner to his or her handler. temperament and body. Schutzhund is actually a high caliber temperament test. A true Schutzhund dog is equally as comfortable in a kindergarten class as he is on the protection field. 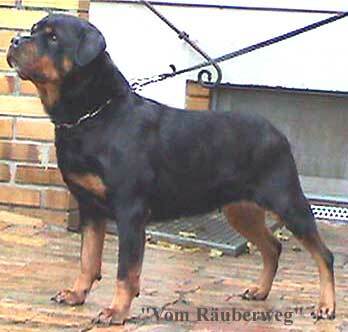 Zuchttauglichkeitsprufung (called the ZTP or BST) translates as "breeding suitability test," and certifies that a Rottweiler is acceptable as breeding stock. 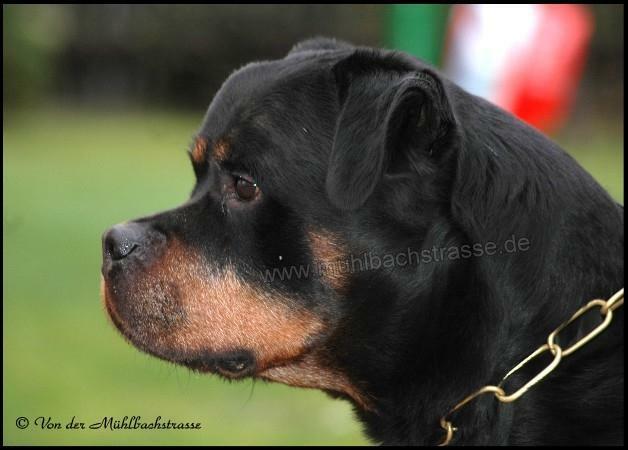 In Germany, a Rottweiler must attain this degree before being bred. The dog to be tested must be at least 18 months of age and be tattooed. The dog must not have any disqualifying faults according to the January 16, 1996, FCI standard. The dog must have successfully completed a VDH sanctioned BH. The ZTP is provisionally awarded until the dog attains OFA certification or has ADRK HD hip approval. There are several phases in the ZTP. First, the dog is measured and weighed. A conformation critique is given, which includes the dog's eye colour and any abnormalities in dentition. The dog then performs a light obedience pattern during which a gun is fired twice, to test the dog's sureness in the face of noise. The dog must heel through a crowd and allow several people to close in on him without a display of fear or unwarranted aggression. The dog is then rated on the characteristics of self sufficiency, temperament, tractability, courage, protection drive, excitability, fearlessness, attentiveness, mistrust, fighting drive, and hardness. All of these, plus the reaction to the gunshots, are noted on the dog's ZTP form, along with his measurements and critique, which is kept on record and entered into the Körbuch. 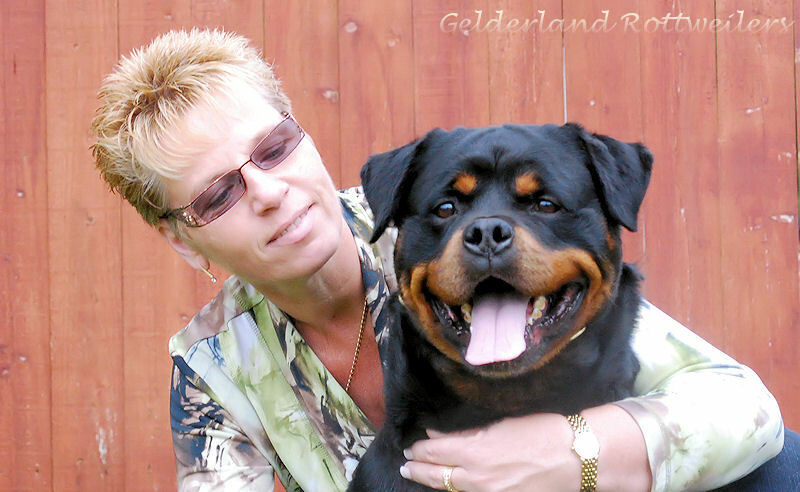 The ZTP is imperative to preserve the correct Rottweiler in both conformation and character, and is highly recommended for all dogs before breeding. release the sleeve upon command at least once during the exercises. Then the Rottweiler must guard the agitator until the judge signals the handler to pick up his dog. for the opportunity to own this stunning dog !! Super dog with excellent personality !